ISLAMABAD, Jul 28 (APP): Paksitan on Thursday ruled out the possibility of holding Composite Dialogue with India without having Kashmir issue on agenda, saying Kashmir remained the centre of its relations with India. “Kashmir will be the core issue in any dialogue with India, whenever it takes place,” the Foreign Office Spokesman said at the weekly press briefing here at the Foreign Office. Spokesman Nafees Zakaria said “Kashmir is our national objective” and Pakistan would continue to support Kashmiris’ right to self-determination. “Paksitan has a principle position on the issue of Kashmir, which is to continue extending moral, political and diplomatic support to Kashmiris for their demand of implementation of UN Security Council resolutions,” he said. The Spokesman said presence of 800,000 Indian security personnel in Occupied Kashmir was a clear example of India controlling over the people of Kashmir against their wishes. “India’s efforts to misguide international community and portraying of Kashmiris’ indigenous movement as an act of terrorism will never succeed,” he stressed. Zakaria said killing of innocent Kashmiris could not be condoned under the guise of calling it terrorism and emphasized that international community needed to take notice of human rights violations in Kashmir. “The people in Jammu and Kashmir have been struggling for last 68 years for their just right as Indian government is indulging in state-terrorism,” he said. He mentioned that Kashmiri people were being denied of medical emergency facilities following their injuries received by shots of pellet guns. 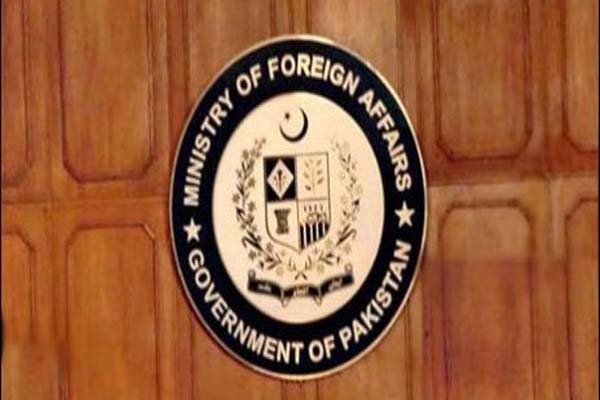 The Spokesman said Advisor to Prime Minsiter on Foreign Affairs Sartaj Aziz in his letters written to UN’s President and Secretary General, Human Rights Commission in Geneva and Secretary General Organizstion for Islamic Cooperation (OIC), had highlighted the prevalent situation in Kashmir. The Spokesman said Paksitan also condemned the continued detention of Hurriyat leaders in Indian-held Kashmir. About the meeting taking place these days between Pakistan Rangers and Indian Border Security Forces, he said it was the routine arrangement between two sides to discuss the operational issues under Border Ground Rules of 1960. He confirmed that Indian Home Minister Rajnath Singh would be visiting Islamabad early next month to attend the SAARC Ministers Conference. About the recently held trilateral meeting between Pakistan, Afghanistan and the United States, the Spokesman said the Director General Military Operations (DGMOs) discussed issues relating to security and border management. He said Paksitan had taken measures to counter and control the traffic across the border with Afghanistan. When asked about Pakistan’s efforts to convince Indonesian government on innocence of Pakistani Zulfiqar Ali due to be executed tomorrow on drug-related charges, he said the embassy was in constant touch with Indonesian high-ups on the matter. “We will not lose hope and will make every effort till last moment,” the Spokesman said about Zulfiqar who had yesterday filed a clemency appeal with President Joko Widodo after languishing in Indonesian jail for 12 years.